We can’t get enough of this classic Greek dish and we especially like this herby version by Felicity Cloake. Serve with salad. Wine Suggestion: we think this works best with crisp, herbal white wines. As we couldn’t find a Greek Assyrtiko we chose instead the Zuani Vigne Collio Bianco, a blend of Sauvignon Blanc, Pinot Grigio, Friulano and Chardonnay from north-eastern Italy. White flowers, peaches, crisp yellow apple and citrus aromas and flavours are followed by a good texture, vitality and fresh acidity. Gently fry the onion or leek in the oil until softened, then remove from the heat and stir in the scallions. Tip into a large bowl with the feta and herbs. Squeeze the spinach with your hands until all of the liquid has comes out, then stir into the cheese mix. Add the egg, lemon zest, a splash of oil and a good grating of nutmeg, then mix with your hands. Season lightly (not too much salt). Heat the oven to 200C/390F/Gas 6. Brush a 30cm x 25cm baking tin with olive oil, then line with half the filo, brushing each sheet with oil as you go and trying not to press down. Leave the excess pastry hanging over the sides. Spoon the filling into the pastry lining, level the top, then put the lid on: repeat the layering process with the rest of the filo pastry. Fold the overhang inwards to form a rim and drizzle with more oil and cut into portions. Bake for 30-40 minutes, until golden and leave to cool slightly before serving. The classic spinach & feta combination never gets tired. These savoury Greek pastries are delicious and very easy to make. We worked out a production line (thanks Tricia & Orla) and had them assembled in no time! Great as a starter or snack with drinks. Perfect entertaining food. Wine Suggestion: If you can find an Assyrtiko, a crisp and delicious Greek white, then you’ve got a great match. Unfortunately it can be hard to find good Greek wines so stick to the Mediterranean and search for a Fiano or Greco di Tufo from Italy. Failing this we’ve had crisp Touraine Sauvignon Blancs with this as well to great effect. Wash and dry the spinach (remove the stalks if they look tough). Finely shred the leaves. Heat the oil in a large pan, add the onion and cook gently until soft but not browned. Gradually add the spinach, a handful at a time, until it has all wilted. Tip into a colander and drain, pressing out the liquid with a wooden spoon, then return to the pan with the scallions and cook for 1 minute. Leave to cool. Crumble the feta into a large bowl and roughly mash with a fork – you can leave it a bit chunky. Mix in the eggs, Parmesan, the spinach mixture, nutmeg, mint and season with salt and pepper. Unroll the sheets of filo and cut the stack lengthways into strips about 7.5cm wide. Brush the top layer with melted butter. Put a heaped teaspoonful of the filling in the centre of one strip, at the end closest to you, and fold one bottom corner of the pastry diagonally over the filling, so that the corner touches the opposite side to make a triangle. Then fold over the filled triangular corner, and keep folding it along the whole strip in a triangular parcel. 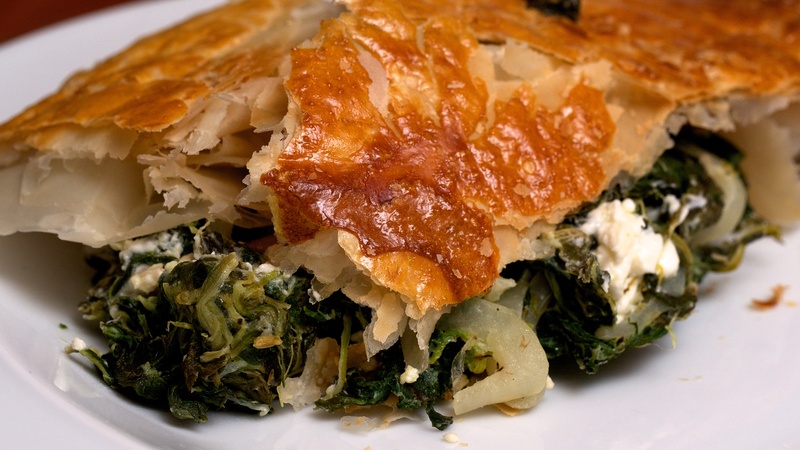 Repeat to make all the spanakopita. Brush the undersides of each parcel with more butter and place on a lightly buttered baking tray. Brush the tops with butter and bake for 25 minutes or until crisp and golden brown. These are best served straight from the oven while the pastry is still crispy but they are also good at room temperature. Inspired by Spanakopita, this is a simple recipe that’s easy to throw together when time is short and requires very little shopping. Heat the oven to 200°C /Gas Mark 6. Put the frozen spinach into a saucepan with a splash of water. Cover and heat gently, stirring occasionally, until totally defrosted. Drain in a sieve, pressing with a wooden spoon. Meanwhile, heat the olive oil in a frying pan over a medium heat. Add the spice seeds and cook for a couple of minutes, then add the onion and sauté until soft and golden. Add the thyme. When the spinach has cooled a bit, squeeze as much liquid out of it as you can with your hands, then roughly chop. Mix with the onion, a squeeze of lemon juice and plenty of seasoning. Keep a few tablespoons of the egg for glazing and stir the rest into the spinach and onion mixture. Spoon half the spinach mixture into an ovenproof dish (around 25 x 20 cm). Scatter over the cheese and pine nuts or cashews, and top with the remaining spinach. Brush a little beaten egg around the rim of the dish. Lay the pastry over the dish and trim. Press the edge down on the rim of the dish so that it sticks. Brush with the rest of the beaten egg and bake for about 25 minutes or until the pastry is puffed up and golden brown.